Quality with a colour pattern that goes well with wood structured funiture. 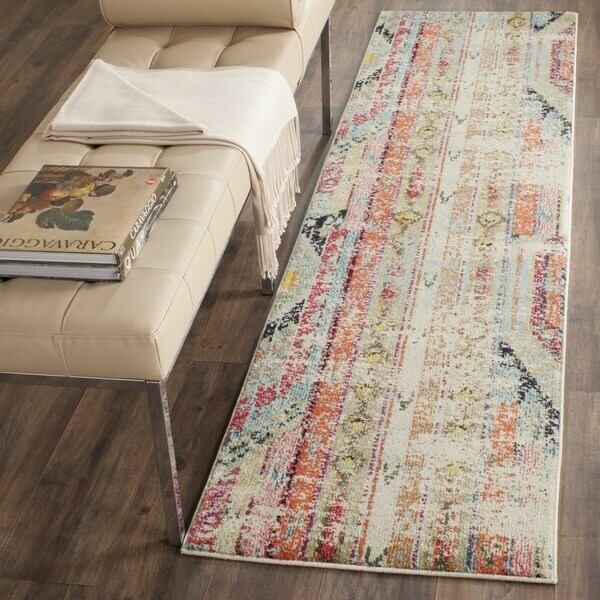 Free-spirited and boldly colored, this 2'2 x 8' rug from Safavieh's Monaco Collection brings Bohemian-chic flair to contemporary and transitional home decor. Featuring neutral hues of cream, beige, and black, and more vibrant hues of pink, orange, and blue, this rug is truly a work of art. Made of power-loomed polypropylene, this rug is virtually non-shedding and is able to withstand high-traffic areas. Its medium cut pile height of 0.5 inches allows for seamless placement under furniture and in entryways. Display this visually charming rug as a focal conversation piece for family and friends to love for years to come. 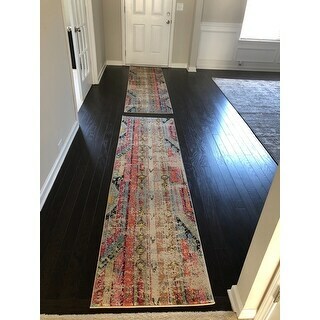 Great runner, a little lighter in color than the 8 x 11 rug, but I have it a distance away from the big one so its not noticeable, glad I purchased the runner. Would like to get a smaller rug like 3x5 or something in the future. This is a beautiful rug. I have it on my tile floor of my hallway. I love the colors and the bohemian look. I did purchase the suggested non slip rug pads. It does help keep the rug in place in a busy area. I bought the runner and a rectangular rug in this pattern. I like both of them. Since they both have many colors in them, they tie into many colors and don't have to match. Both rugs are distressed slightly differently but it doesn't bother me. After all, distressed should be a bit random. They are thin rugs and need a rug pad to hold them down if they don't have furniture on them. Also, a padded rug pad would make them more comfortable if you plan to sit on these rugs. Overall, I'm quite happy with them. 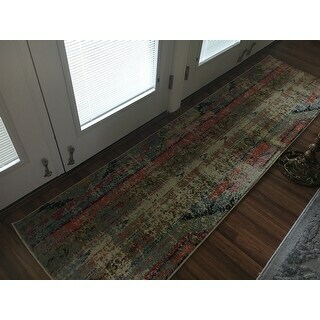 Wanted a really nice and "happy" looking runner for our hallway from the garage to the kitchen, this rug fits the bill perfectly. The quality is much better than we expected and the colors are really nice. Considering getting a second one for the front hallway as well. Very pleased. I have three of the rugs in this pattern from. Safavieh monaco vintage bohemian collection. I bought this runner for an entrance and its just as durable and beautiful as the other two I purchased! I would definitely rocommend it!! I had already purchased an 8 x10 version of this Safavieh rug. I choose it for the vintage look, but also for the colors of teal, orange and beige. They are blended together beautifully. I wanted the runner to cover an area that the rug did not. This runner matched perfectly with the Safavieh Monaco Vintage Bohemian rug. The colors are muted as expected but still vivid. Great product. I cant believe how inexpensive this rug was for the quality it is. The detentions described were exact. The rug colors are bright and colorful. The picture I saw online was very accurate. I love it. My daughter is going to get two rugs she thought it was so nice. Many rugs look thick and heavy in the picture than when you get it, it is thin and flimsy but this rug is thick, plush and when you stand on it your toes sink in to it, thats how plush it is. The price you cant beat anywhere. !! If you need a rug I can assure you that you wont be disappointed. Also, I ordered it on a Saturday and got it Monday. That’s only two days. Awsome ! !I would have no problem recommending this rug to anyone. Looks great in my mudroom. I love the color it adds. Very well made and has held up great being a high traffic area. Definitely would recommend a non-slip pad or I used rug tape to hold down. Just as described on your site. The color is as shown and works well with my color scheme. Laid flat quickly in a day or two after weighting down the corners & center of the runner. Size & depth as described. Arrived quickly in time line given & packaged well. Don;t get the high reviews! Pattern looked spray painted on with significant odor, and weirdly textured bald spots that deviated from the rest of the rug, and the odor. Colors were mainly fuschia/orange. I'd give Overstock Cust Svc ++3 stars for smooth return assistance! Using these runners to tye in some color in my decor. I needed two for my entry way. They fit perfectly and I have received so many compliments on them. I loved it so much I purchased the matching round rug for under my kitchen table. That table is temporary it will look so much nicer with the new table I purchased. Love the colors, very fine quality. Thin rug and weird coloring - however with a non-slip pad it is very forgiving of spills and pets. I love it! Yes I would recommend it!! Such a beautiful rug. The colors are vibrant, yet muted if that makes any sense. It adds a perfect pop of life to my otherwise monochromatic color scheme. I had purchased initially for my kitchen and loved it so much I bought a second one for my bathroom. I can’t say enough about these Safavieh Monaco Vintage Bohemian runners. Beautiful colors though somewhat muted. I have three! So many compliments from family and friends. I would definitely suggest purchasing the pad to go with! Gorgeous! Doesn't lay flat but I'm thinking that will correct itself with time. Gorgeous and serviceable--what more could you ask for? I also got a non-slip to put under this so no one will fall it it decides to move. "Hi, is the one prominent in this rug? I think I may have just bought 5! It looks just like the Curad Nomad Bernal Vintage Bohemian rugs you have. I wasn’t able to find various sizes though. We’d really like a 8’x10’, a 3’x 5’, a 11’ runner and two 6’ runners, all with pads. Can you tell me if the Bernal rugs are available in the sizes I mentioned and if so, are they nicer than the Monaco vintage Bohemian rugs? If they are, we’d like to switch out order to the Bernal if it’s possible, because f the pink too, pink won’t work! 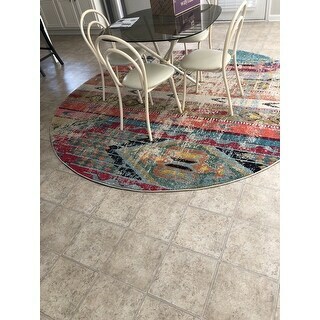 Thanks for getting back to me, I hope you can before anything is shipped, Lisa "
This rug is available in all of the mentioned sizes except a 2x11 runner; it comes in a 2x10 or a 2x12. "Does this rug have a non skid backing and is there any aqua in the colors?" Not a non skid backing. I use a rug pad under it to keep it in place. There is some aqua, but coral is the main accent color in mine (on an off-white background). Not a non-skid back but we put caulk on the back which makes it not slide. There is some aqua in the rug. I haven't needed a rug pad on a hardwood floor, but this runner is in a smaller hallway, so it can't go far. A pad would probably be helpful. I would call one of the blues in this rug an aqua, but what I love about it is that the blue colors (aqua, light blue and dark blue) are swirled in the pattern so none of them are too dominant. I think it would be great where you need aqua accents. I love this rug. "Polypropylene, isn't that plastic and will crush easily? I had an olefin rung which did. this is a cool looking rug but the poly fiber holds me back. How long does this hold up?" I have two runners. The rug is soft under bare feet. Doesn't show foot prints. My jack Russell dog loves sleeping on the rug. Would buy again. I bought this and absolutely love it it is soft to walk on and I believe it will last a long time, hope this helps! "There are so many rugs I would like to get but, there are no care instructions. I would like to see how to clean these rugs. Am I missing it somewhere?" I don't think I could ever get it in a washing machine -- I assume you would have to clean with a carpet cleaning machine. It is real stiff--not like a throw rug. "Wondering how much of the RED color is prominent? I love the look of this, but red is a color I don't really want in the room...if it's rustic red that's okay, but some reviews suggest the colors are much more vibrant than in the photos. Thank you!" It is a vibrant rug but the distressing tones it down a bit. I must say I was surprised by how accurate the coloring in my rug was to the pictures online! I think the red is "true red" and not rustic. The red is not overt... there is just a bit of it and I would describe it as more of a dusty raspberry. I love this rug. The colors are muted, and with so many colors we can change the accent pieces in the room and have a totally different look. "Is the coloring muted or bright...have seen contradicting reviews and pix close up look different. I'm looking at the runner, and a smaller rug"
The coloring is a distressed muted color. They aren't neon, but they're bright. The colors are true to the pictures & videos that Overstock provide. They are not overpowering in any way. Love them. The colors are both. the distressed areas are very muted and the bolder shades are bold. Its a very different abstract runner. Adds a pop of color. Nice.